People express their mental states, including emotions, thoughts, and desires, all the time through facial expressions, vocal nuances, and gestures. This is true even when they are interacting with machines. Our mental states shape the decisions that we make, govern how we communicate with others, and affect our performance. The ability to attribute mental states to others from their behavior and to use that knowledge to guide our own actions and predict those of others is known as the theory of mind or mind-reading which makes computer reading your mind. Existing human-computer interfaces are mind-blind — oblivious to the user’s mental states and intentions. A computer may wait indefinitely for input from a user who is no longer there, or decide to do irrelevant tasks while a user is frantically working towards an imminent deadline. As a result, existing computer technologies often frustrate the user, have little persuasive power and cannot initiate interactions with the user. With the increasing complexity of computer technologies and the ubiquity of mobile and wearable devices, there is a need for machines that are aware of the user’s mental state and that adaptively respond to these mental states. The mind reading actually involves measuring the volume and oxygen level of the blood around the subject’s brain, using a technology called functional near-infrared spectroscopy (FNIRS). The user wears a sort of futuristic headband that sends light in that spectrum into the tissues of the head where it is absorbed by active, blood-filled tissues. The headband then measures how much light was not absorbed, letting the computer gauge the metabolic demands that the brain is making.The results are often compared to an MRI, but can be gathered with lightweight, non-invasive equipment.Wearing the FNIRS sensor, experimental subjects were asked to count the number of squares on a rotating on-screen cube and to perform other tasks. The subjects were then asked to rate the difficulty of the tasks, and their ratings agreed with the work intensity detected by the FNIRS system up to 83 percent of the time. 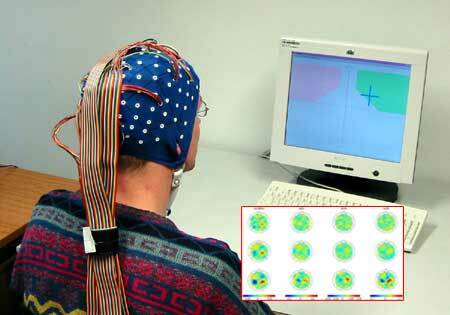 There are other means of reading brain activity than direct neural contact via pins. The first and most common is electro encephalo-graphy (EEG) where electrodes are placed against the scalp are used to pick up brain signals. However, this approach is not nearly as accurate as direct neural contact and can only pick up blurry, weak readings. 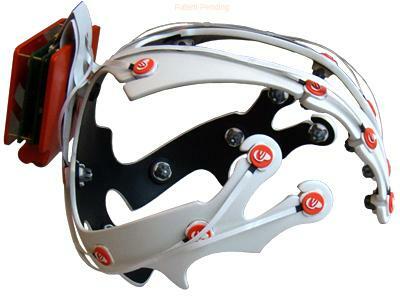 The other, much newer and much more accurate non-invasive technology is magneto encephalography (MEG) but is also more equipment intensive. Using MEG requires a room filled with superconducting magnets and giant super-cooling helium tanks surrounded by shielded walls. These were basic key points that show how does mind reading work. New technology could allow people to dictate letters and search the internet simply by thinking, according to researchers at Intel who are behind the project. Unlike current brain-controlled computers, which require users to imagine making physical movements to control a cursor on a screen, the new technology will be capable of directly interpreting words as they are thought. 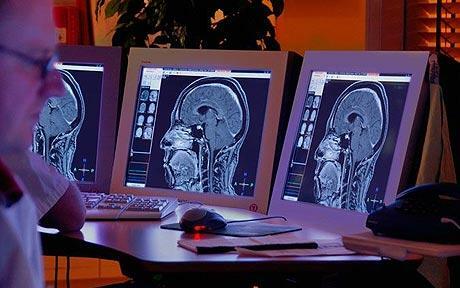 Intel’s scientists are creating detailed maps of the activity in the brain for individual words which can then be matched against the brain activity of someone using the computer, allowing the machine to determine the word they are thinking.Preliminary tests of the system have shown that the computer can work out words by looking at similar brain patterns and looking for key differences that suggest what the word might be. This prototype mind-controlled wheelchair developed from the University of Electro-Communications in Japan lets you feel like half Professor X and half Stephen Hawking—except with the theoretical physics skills of the former and the telekinetic skills of the latter. 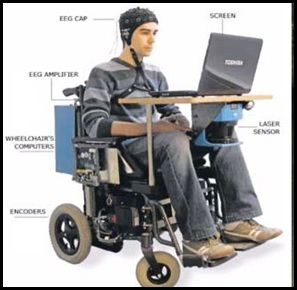 A little different from the brain-computer typing machine, this thing works by mapping brain waves when you think about moving left, right, forward or back, and then assigns that to a wheelchair command of actually moving left, right, forward or back.The result of this is that you can move the wheelchair solely with the power of your mind. Do share your feedback and any other additional information on Mind Reading Computers.